Gotcha 😉 The above is of course a quote (Ghost, Act I, Scene V); the long awaited Barbican production of Hamlet is by no means horrible, but that doesn’t mean it’s great either. Unfortunately, most of the changes done to the text have already been communicated by so-called professionals (I won’t go into detail here, but maybe do a different blog post about what ticked me off beforehand), so the first scene being cut in favour of Hamlet listening to Nat King Cole wasn’t a surprise. No worries however, the play is still the world’s longest knock knock joke with Hamlet calling out ‘Who’s there?’ to Horatio instead. But what do you expect from a guy in his late 30s who is leading on a little girl? At least this is the impression that came across to me with Ophelia. In the first scene we see her, when everyone claps, she does as well, but not like the others. There is a little kid seal clap going on and that’s symptomatical for Siân Brooke’s entire performance. Considering Benedict Cumberbatch is 39, this infantile portrayal was not only unnerving at times, but also a bit creepy. Especially if one is on the ‘Ophelia is pregnant’ side in the general Hamlet discussion. Ophelia’s brother Laertes (played by Kobna Holdbrook-Smith) on the other hand did not talk down to her in a fatherly way like a lot of Laerteses tend to do, but managed to get the advice about not letting Hamlet too close across in a natural, brotherly fashion. The third one in the family is of course Polonius. Polonius can be funny, silly, or in this production dispensable. In this version, he is only funny due to the other characters’ reactions to him. It pains me to say it, but the choice to have him read everything off notebooks, including his speech to Laertes backfired spectacularly. Him mumbling all his fatherly advice practically killed the famous ‘This above all — to thine own self be true’ that packed so much punch in Stratford’s current production where Polonius went from hilarious (and mocked by his children behind his back) to dead serious without missing a beat. The same goes for the nunnery scene. Hamlet’s ‘get thee to a nunnery’ is presented with a matter-of-fact resignation that the entire scene falls flat even though it’s a key scene for Ophelia’s fate. On to the royal family: Hamlet the elder looked a bit like William Forsythe in Scrooged (without the golf balls dropping out of him). As always, Karl Johnson delivered a solid performance, although I preferred his later turn as the gravedigger. His brother and sucessor Claudius came across as Denmark’s CEO. Even when he ordered his more than kin less than kindly to be disposed of, I didn’t find him threatening in any way. I also couldn’t figure out why he and Gertrude had married, probably a business decision in this production. I was really looking forward to Ciarán Hinds in this role and was sorely disappointed. Anastasia Hille’s Gertrude started out like most Gertrudes (the not-alcoholic half of them), but I began to really like her after intermission, especially when she actually showed Claudius the cold shoulder, since usually her taking the lethal drink is the only time she opposes him. And now for our titular hero, Hamlet. Let’s be frank, most of the audience probably were there to see Benedict Cumberbatch; the speed in which the production was sold out was a massive clue. You could also tell who was at the theatre for the first time – good on every single one of them and I hope they have been bitten by the bug and check out other plays. Cumberbatch did not disappoint. He managed both the (many) lines and the physical aspect of Hamlet really well and I have a feeling that he would have been capable of even more hadn’t the production let him down. The madness was too unsubtle to be believable. Either they just had fun going completely over the top (it was definitely fun to watch) or this Hamlet took his uncle, mother and the court for complete idiots who didn’t deserve his cleverness. Moving the ‘To be or not to be’ speech (I refuse to call it soliloquy even though in this case it was one due to the move) to the second act actually made sense. 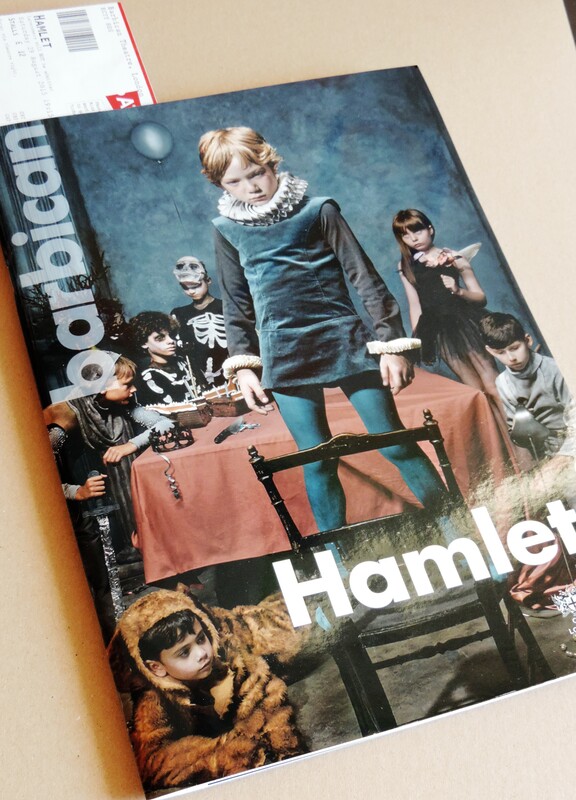 If you read this blog regularly, you already know that I’m not kidding around when it comes to Hamlet; if not, welcome and I don’t kid around when it comes to Hamlet. In this case however, I can’t find anything wrong with changing up the sequence. The final two lines have to wait for two scenes to make an appearance, but that’s done in a way that newcomers to the play wouldn’t have noticed as well, so all is good. One thing stood out for me in Benedict Cumberatches performance: a lot of apostrophes were exchanged for the vowel they are usually replacing. I would love to know how this decision came about (has anyone created the job of ‘Official Rehearsal Spectator’ yet? I’d consider a career-change). Visually, there was a lot of stuff going on, at times even too much. I liked the design of Elsinore’s interiour and Hamlet’s playthings were outrageously funny. The costumes were confusingly non-linear in period; I have to say I absolutely loved the Player Queen’s 1970s outfit especially and you can’t go wrong with a David Bowie T-Shirt. The tempest right before intermission was visually impressive and unexpected, I wasn’t a fan of the condition the stage was in after intermission though. I get what they were trying to express with it, but it was too in your face for me personally. It was a nice evening out seeing a good play with selected stellar performances, interesting to see such a big production and I’m curious to see how it comes across on screen for the NTLive broadcast. It was however far from being my favourite Hamlet. A lot of the beautiful language was pushed into the background for grand gestures when in my opinion, the play should be the thing. More matter with less art would have done it for me. PS: If you have the chance to go to the Stratford Festival in Canada in the next month or the recording of their Hamlet pops up in your local cinema, run to get a ticket and be amazed. This entry was posted in Live, London (UK), Reviews and tagged Amaka Okafor, Anastasia Hille, Barbican, Barry Aird, Benedict Cumberbatch, Bret Yount, Christopher Shutt, Ciarán Hinds, Colin Haigh, Dan Parr, Diveen Henry, Dwane Walcott, Eddie Arnold, Es Devlin, Hamlet, Jan Shepherd, Jane Cox, Jim Norton, Jon Hopkins, Julia Horan CDG, Karl Johnson, Katrina Lindsay, Kobna Holdbrook-Smith, Leo Bill, London, Luke Halls, Lyndsey Turner, Matthew Steer, Morag Siller, Nigel Carrington, Paul Ham, Ruairi Conaghan, Rudi Dharmalingam, Sergo Vares, Siân Brooke, Sidi Larbi Cherkaoui, Sonia Friedman Productions, Theatre. Bookmark the permalink. Thanks for the hint, I forgot to check out her review after seeing the play (I tried to read as little about it as possible beforehand). We definitely seem to have the same take on this production. I’m curious to hear your thoughts! Hmmm, watching the Branagh-Version instead of reading the play does sound tempting… 😉 It’s really the FULL text?! Yup, that’s why it’s four hours long, but definitely worth the time. I guess sometimes ignorance is bliss, indeed. I haven’t seen that many versions of “Hamlet” (haven’t even managed to watch Kenneth Branagh’s film, as we discussed above), so I don’t really have any expectations about what any of the characters should be like. Well, maybe a little bit about what I look for in a Hamlet, but other than that I’m pretty open. We actually liked Polonius more in the broadcast than back in August. S and I both think there have been further tweaks in the production since then. Ophelia was still too creepily childlike for me. I really hope you get to see the Stratford production one of these days (it has been filmed), the nunnery scene alone is such a difference.